I am thinking it might be a good idea to do all my tag catching up on one Blog post, so that followers aren’t getting 3 or 4 blog posts in one day. I will start with the Day 8 tag. The sponsor for Day 8 is Sunny Studio. I was inspired by the cute little single image scenes in Mendi’s tags. I was also inspired by my own desire to use this nifty little stamp set that I had not yet used. 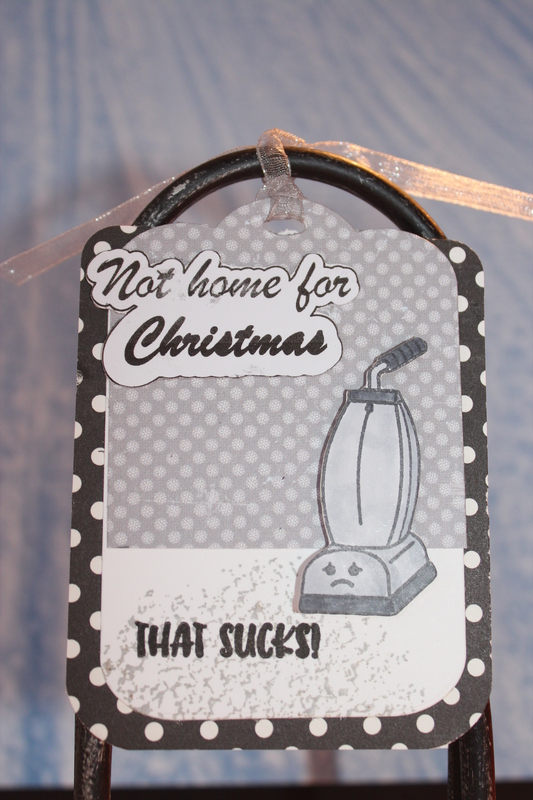 It wouldn’t be the first stamp one would think of, when making a Christmas tag, but I had fun making it work. Here is a catch up tag from Day 3. Sponsor is Casual Fridays. This is a bit of an easy one as my tag dies of choice are from Casual Fridays. They just seem to be the right size and shape in a majority of cases. It isn’t hard to tell that the inspiration for my tag comes from a combination of Kimberly and Kelly’s tags. 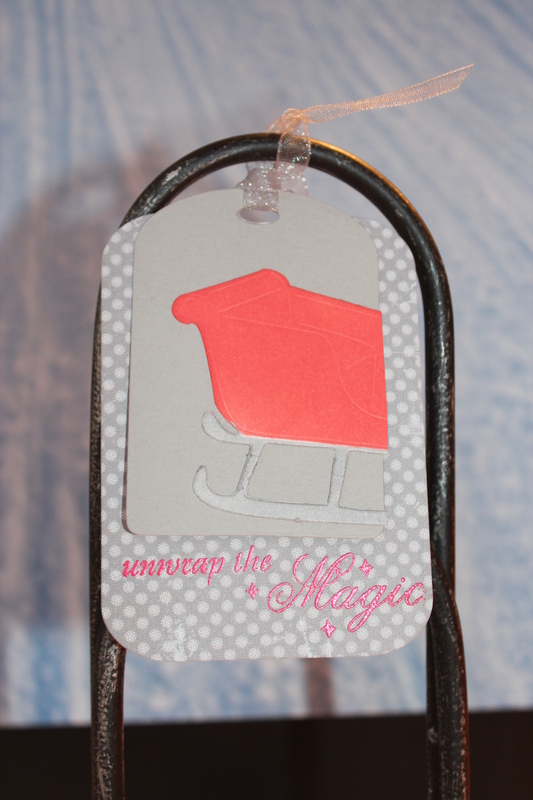 I used the exact layered tags as Kimberly did and I used the slice of a sleigh idea from Kelly. The To and From on my tag is hidden below the smaller tag. Unwrap the Magic sentiment is from Hot off the Press. Next up is a catch up tag from Day 7. The sponsor is Birch Press. Unfortunately, I don’t own any Birch press stamps or dies. Using Tracey’s tags as inspiration, I substituted a Cheery Lynn die. 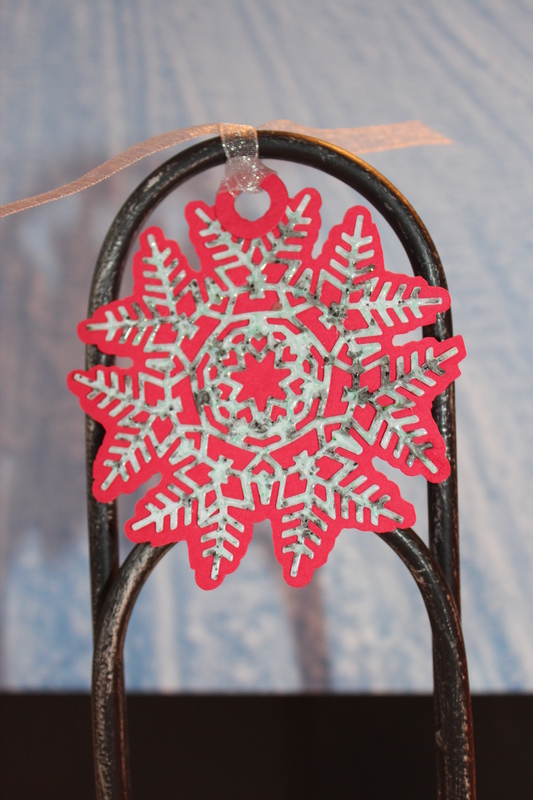 I used my Scan and Cut to make an outline of the snowflake in red cardstock. I had recently bought a jar of Fractured Ice embossing powder from Emerald Creek Trading Co. and I was anxious to try it out. It is a thick clear, yet slightly greenish embossing powder with dark flecks that look like dirt particles or debris in it. Doesn’t it just sound yummy? It is actually beautiful, as it reminds me of the pond ice I used to skate on as a kid. That ice was not pristine either, but rather had small twigs and leaves suspended in it. Posted on November 9, 2017, in Uncategorized. Bookmark the permalink. 1 Comment. Every tag a charmer, Deb … you have a great sense of humor! Thanks again for Tag-ing along with us!